The ultimate combination of work, fun and food! 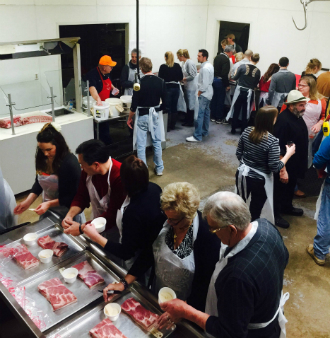 Our team building activities offer a chance to learn, hands-on the art of bacon making or the German tradition of sausage making while forging effective coworker relationships. Team building events have been shown to help form genuine collaborations that work inside and outside the office. Join three-time hall of famer Wurstmeister Mike Sloan for these collaborative team building activities that are both informative and entertaining. Mike enthusiastically shares his passion and years of experience with his students as they work together to make a delicious product. Wurstmeister Mike has created two team building classes, Sausage Making 101 and Makin' Bacon 101. Classes last 2-2 1/2 hours and are best suited for teams of 15-25 students. Cost is $79 per person and includes lunch, a beer and bratwurst tasting, 2 pounds of sausage or bacon (made by you!) and a Wurst Haus goody bag. Participants receive 10% discount on in store purchases that day. Class is by reservation only. Attendence is limited to 25 people, call 573-486-2266 to set up a team building event or complete the form below and we will be in touch with you shortly! The Wurst Class with Wurstmeister Mike is da bomb! We had a great time getting our hands dirty mixing our team's own special recipe of sausage. Not only does Mike provide plenty of ingredient options, but also sage instruction and advice. Extruding sausage into the casing was an experience all of us will remember - along with all the obligatory sausage jokes! Fun and tasty event!